I come from a multi-cultural family, one part of which is of Japanese descent. Growing up I recall my grandmother’s beautiful kimonos, vintage tea ceremony cutlery, and photographs of her in Japan dressed in traditional Japanese regalia. 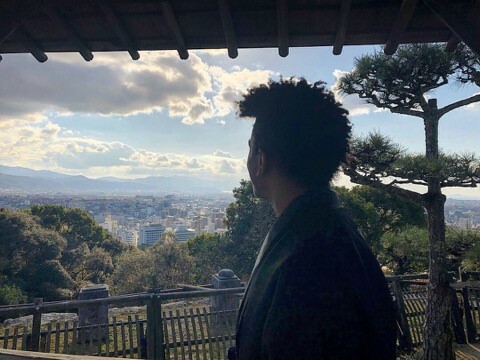 I brought these memories and stories with me to Japan in the hopes of navigating the life of my grandmother as well as creating my own narrative of what Japanese culture and heritage means to me. 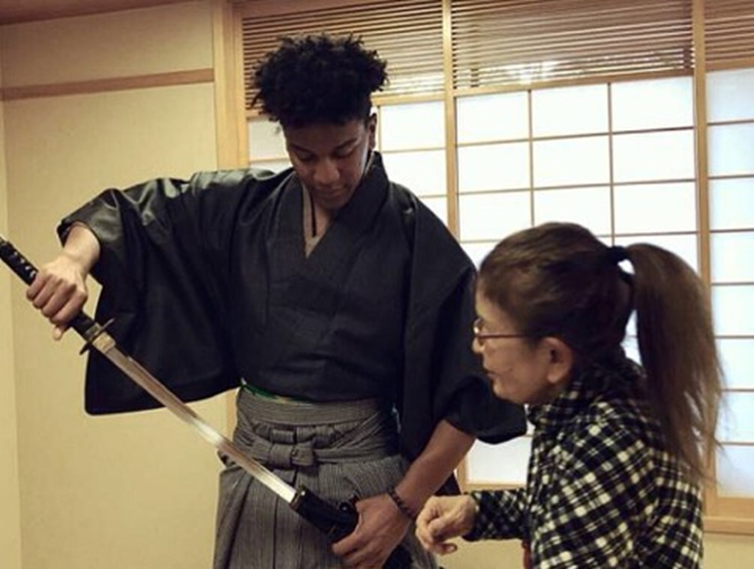 So far I have been able to participate in tea ceremonies, visit shrines, and have been invited into the homes and company of Japanese locals to share delicious customary foods. But this day, December 24th, I woke up with a new adventure set in mind. 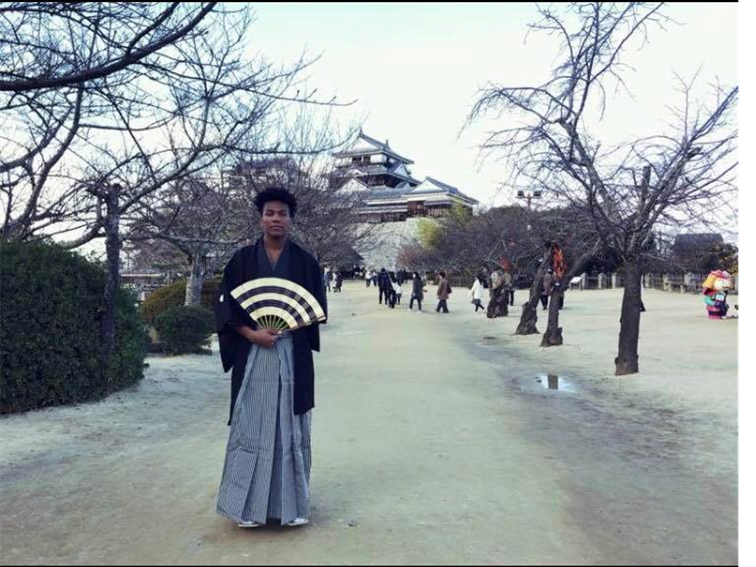 I would be dressing in a traditional Japanese kimono and trekking to Matsuyama Castle. I arrived at a small studio in Matsuyama Park, just a few minutes before noon, dressed in my lazy weekend clothes without a clue of how to present myself. Quickly, a woman who I have come to call, “Super Sensei” quickly assessed my stature and size just by glance and began to gather robes and cloth. The bundle of fabrics came in different hues of blue and grey and were embroidered with slivers of green and gold. In minutes, my sloppy weekend clothes were shed and I was being dressed in layer after layer of the bundled cotton cloth. The process was quiet and decisive. The attention to detail was exceptionally impressive and the motion of every tie and knot was hypnotically satisfying to witness. It was clear to me that every layer placed on me, including the order of how they were arranged had been memorized. A specialty skill, I can only assume, was passed down to her. When the process was complete and I was deemed adequately dressed, I was allowed to explore the handy work of Super Sensei in the mirror. Examining myself in the mirror from head to toe, my eyes lingered on the sharp edges of the kimono and marveled over the custom embellishments carefully placed on my chest and waist. I began to daydream of my grandmother and the photographs of her and her family dressed in looms of blue, white, and pink fabric. I felt in my heart that some way, some how I was sharing a similar feeling of distinguishment and pride they had illuminated in their photos. I not only looked the part of a properly dressed Japanese samurai, but I also felt it. Walking around the studio I took note of my posture and movements. The kimono felt tight and secure, but also free flowing, allowing swift and fluid movement if needed. Little did I know the real challenge was still ahead of me. Before I set off for the days castle adventure I was given one last piece to make my collection complete: geta socks and sandals. I no longer moved around like a graceful show pony full of pride, but rather resembled a baby doe learning to walk fresh from the womb. Even though my walking proved quite embarrassing, I still needed to get to the castle. Ropeways, chair lifts and gondola rides were not permitted means of travel for the day. No, I would be making my way to the top of the hill to the castle by foot. Starting at the entrance of the park, I tip-toed my way towards the steep incline that was the mouth of the nature trail leading to the hills’ peak. My baby steps became confident steps with practice and patience. Eventually those steps turned into gliding strides. I couldn’t hide a smile as locals bore witness to my kimono, stopping me for a picture, or pointing and smiling with their families from afar. I was hiking in geta, and although not perfectly, I was succeeding. I was smoothly navigating rocky terrain while maintaining my kimono in one hand and wielding a fan in the other. With every other step, I stole glances up from my feet to the beautiful nature around me. Bamboo trees grew tall and leaned from side to side, evergreen thickets riddled the trails’ edges, and other travelers made their decent from my prized destination. They offered smiles, best wishes, and encouragement as I continued to climb step by careful step. Finally, the mountain peak came into view and a rush of accomplishment filled my body. I was tired, and a bit shaky from gripping the sandals with my toes so intensely. I found a new respect and appreciation for the practice of wearing a kimono and geta along my way to the castle. The task heavily relied on self-awareness instead of self-appreciation, as well as a lot of patience. After a few more inclined paths, tripping twice more, and swimming through crowds of travelers and locals all celebrating Christmas Eve at the castle, I reached my prize: the top. The square in front of Matsuyama Castle was full of people. Local booths were erected and men dressed in happi coats were serving special treats and warm drinks. Travelers gathered around the perimeter of the square capturing pictures of the breathtaking views of the city. Men dressed from head to toe in traditional Samurai armor took pictures with families and small children while other visitors rested on benches enjoying the beautiful weather and matcha green tea ice cream. Children ran around chasing each other with small trinkets and toys, and families laughed with each other, lamenting the year. I sat down on a tree stump after buying a cone of matcha ice cream and looked out over the city. The sun was high and gave warmth to what would otherwise be a chilly day. Eating my ice cream I couldn’t help but begin to daydream again of my grandmother. It’s a process I find myself doing often; looking back on my past while moving forward towards my future here in Japan. I wouldn’t be Christmas caroling or decorating cookies on Christmas Eve this year, but instead I was basking in the sunlight in front of a historic Japanese castle dressed in samurai regalia and eating green tea ice cream. Joshua Hill is a 23 year old American from Indianapolis, Indiana. A graduate of Hanover College, he has an English literature degree with theology and sociology minors. Joshua enjoys music, writing, art history, and researching spirituality practices.